Buddhism is one of the most popular religions not only in India but also across the globe. India being the birthplace of Buddhism is home to numerous wonderfully tranquil monasteries which are visited by Buddhists from all over the world. 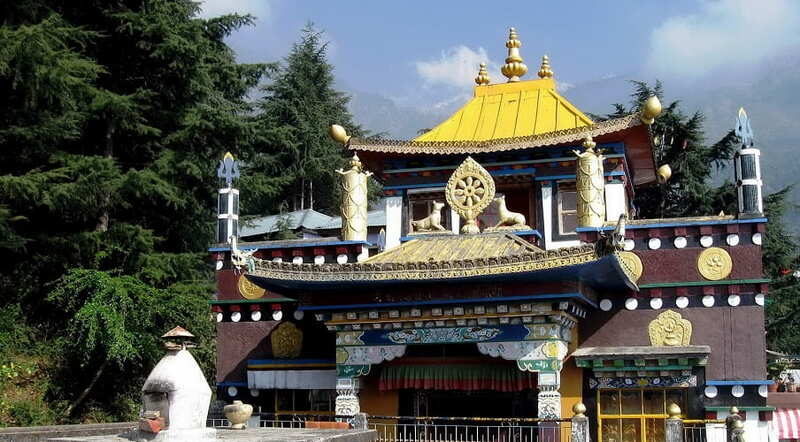 There are Buddhist monasteries in almost every state of India which are highly revered for its piety and reverence. These monasteries houses and depicts the teachings and preaching of Lord Buddha. From Leh Ladakh in the north to Mysore in the Southern tip of the subcontinent Buddhist culture is widely practiced in India. A visit to these sacred centres of worship will evoke a sense of deep spirituality. The meditative chants, quiet environment and the fragrance of incense laden air make a visit to monastery extremely soulful and memorable. The abundance of Buddhist monasteries and stupas in India makes it one of the top pilgrimage destinations for Buddhists from across the globe. 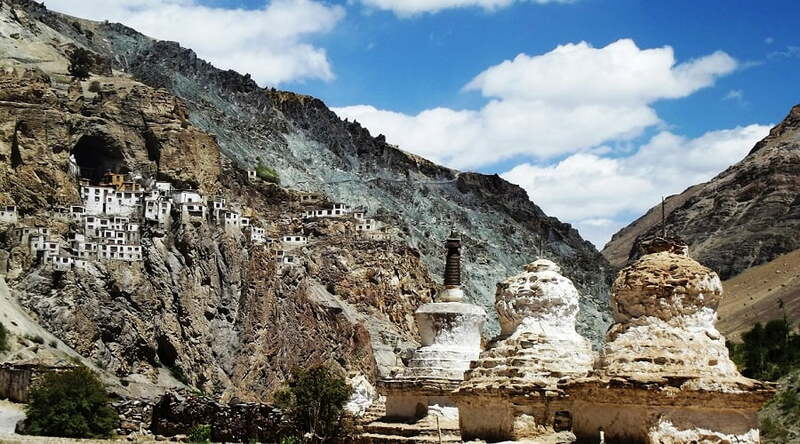 Located atop a barren brown hill at an elevation of 13,668 feet above sea level this monastery is nestled close to the Spiti River inside the Spiti Valley. 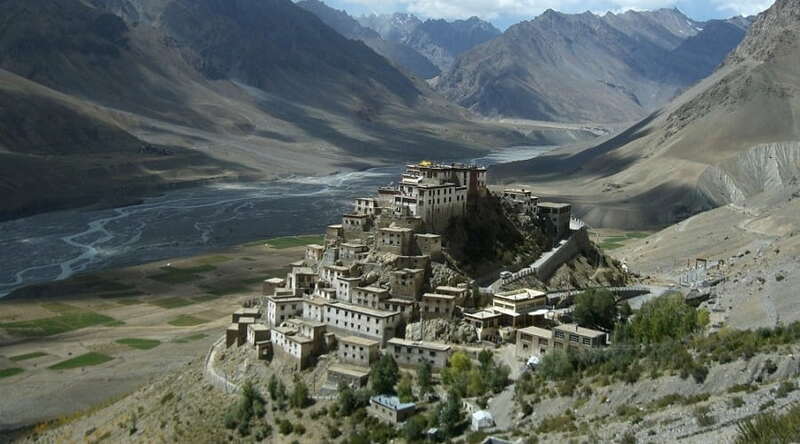 This is the biggest and one of the oldest monasteries in Spiti Valley. The entire monastery sanctuary gloriously represents the Chinese architecture and houses a vibrant collection of ancient books on Buddhism along with Buddhist paintings and scriptures. Getting there – from Shimla you will make your way to Kaza which is the base of the monastery. From here the monastery is located at a distance of 15 km which can be covered either by walking your way up or by hitchhiking a ride. This personal monastery of the 14th Dalai Lama is considered to be one of the holiest monasteries in India and the world. This centre of learning houses numerous other temples and sites of worship where special prayers are carried out every day for the betterment of Tibet. More than 150 students are being taught here on a daily basis that learns about different religious practices, tantras and sutras. Getting there – located at a comfortable distance from the city centre reaching the monastery takes no more than 45 mins if you are travelling via the NH503 and Khara Danda Marg. You can opt for reaching there by hiring a taxi or driving your own car. Best time to visit – throughout the year due to pleasant weather conditions. 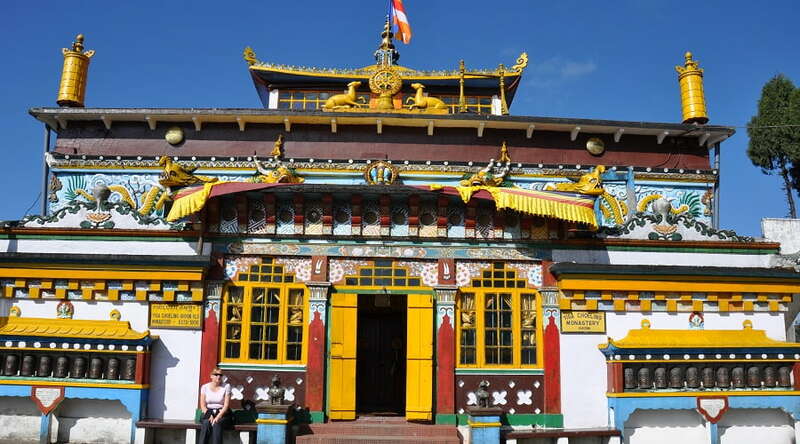 Located near Gangtok (capital of Sikkim), founded during the 9th century and relocated to India during the 1960s, Rumtek is the largest and the most visited monasteries in the entire region. Due to several controversies surrounding this holy centre, it is one of the most closely guarded monasteries in the subcontinent. This colorful holy site attracts numerous visitors all year long. Getting there – there are shared and private taxi available for you to get there. You can also opt for the local bus service from Gangtok to Rumtek. The vehicles will drop you off at the point below the monastery from where you will be required to walk uphill towards the main entry for the monastery. Established by Pema Norbu Rinpoche and located in the Mysore district of Karnataka, this monastery is one of the prime centres of Buddhist teachings. 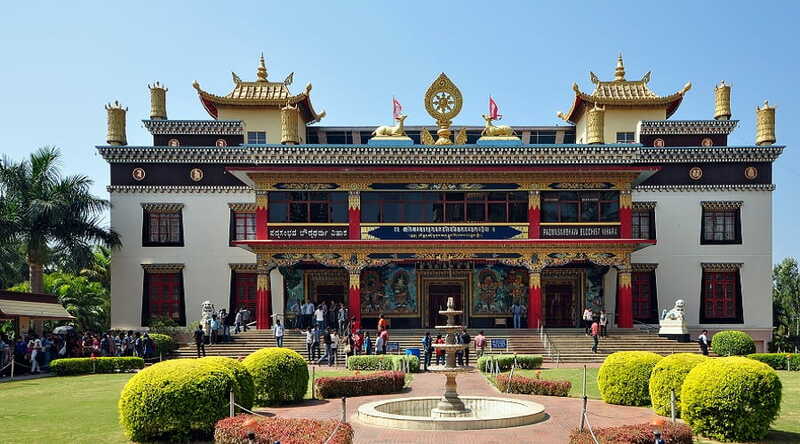 Apart from the religious and spiritual teachings this monastery also offers teachings in subjects like, philosophy, debate and logic in the University of the Same Name built within the monastery premises. 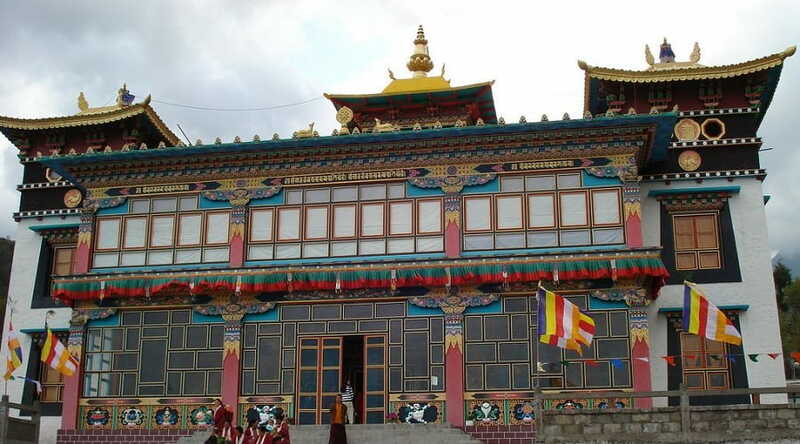 Getting there – the monastery is situated at a distance of 6 km from Kushalnagar. Visitors have the option of either hiring a cab or driving your own vehicle up to the monastery. This isolated hilltop monastery is located in the district of Jammu and Kashmir; Phuktal is a cluster of several small mud and wood monasteries which replicates a honeycomb. This 2,250 years old gompa’s primary attraction is a cave through which the flowing water remains the same despite the pace of water outside. The school present within the locality offers free education to the kids of the nearby local villages. Getting there – no direct transportation service is available in the area making trekking the only way to reach there. From Padum you will be required to reach Anmo village from where trekking further will make you reach the main monastery gate. It is advised to take the help of a guide or a local person for a safe journey. Built in the year 1850 and situated at a height of 7,470 feet above sea level, this place one of the very few monasteries which serves as the main Buddhist scriptures learning centre. 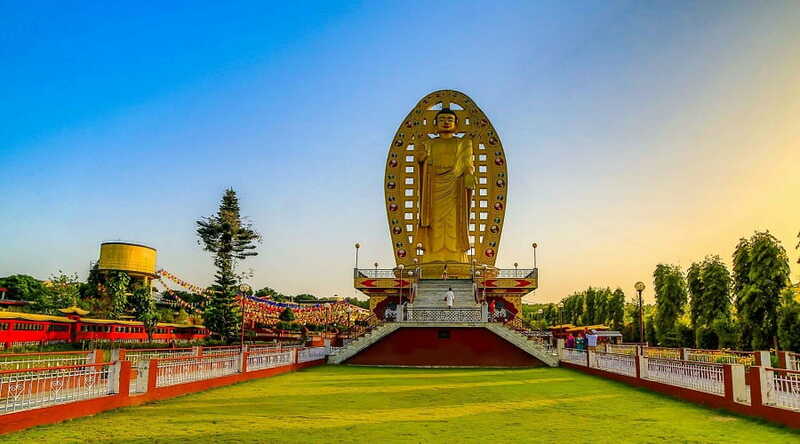 Present inside the monastery is a 15 feet high pure gold statue of Lord Buddha, which is adorned with precious stones with two huge oil lamps lit in front of it which remains aflame throughout the year. Getting there – by car you will reach ghoom monastery in 30 mins from the Darjeeling town centre since it is located at a distance of 8 km. Literally meaning ‘a place of perfect emancipation’ this monastery was founded in the year 1676. It is also considered as one of the largest Buddhist viharas present in India. Along with learning about the Holy Scriptures, devotees are also taught Tibetan medicine and Tibetan lunar calendar. The enchanting surrounding beauty of the monastery attracts numerous visitors to visit this place and distress. Getting there – situated on the Delhi – Saharanpur road at a mere distance of 4 km from ISBT of Dehradun. The monastery is easily reachable via a local cab, bus or auto. 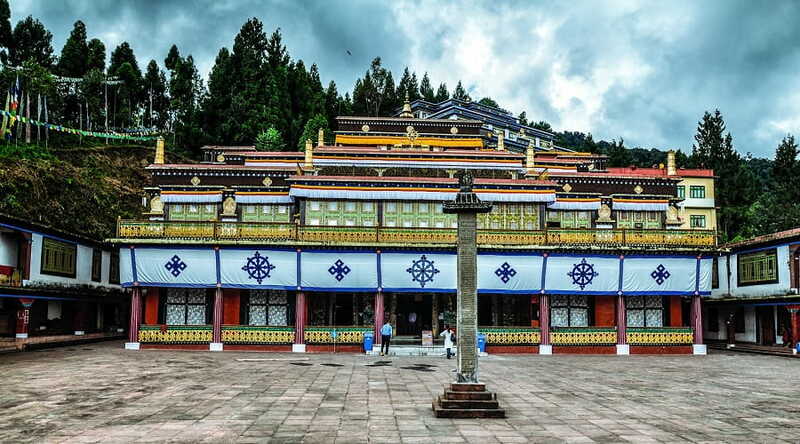 Situated at a height of 3,000 metres above sea level amongst the lush greenery of Tawang, this monastery has been recognized for being the second largest monastery in the world (first one is Lhasa). This 400 year old centre of spiritualism is home to almost 300 monks and attracts Buddhists from all over the world. Founded by the 5th Dalai Lama in the year 1860-60, the monastery library is stocked with valuable ancient holy scriptures. Get in touch with some peace of mind and embrace the subtle lifestyle. Getting there – located in Cona, the monastery can be easily reached via a taxi which will be a drive of half an hour. You also have the freedom of exploring the place on foot.